It is often said that the customer is always right…. But are they? Bridging the gap between the real issue and the confused emotional state of a customer can often be a challenge. Confused information and a misunderstanding of products or services can lead to the customer being right in terms of how they feel about a particular situation, but quite wrong in terms of what it is they need to resolve it. The important thing for a business to remember is to listen. Listen to what your customer wants – not in a general market sense, but in a very individual and specific way. Give them your time, patience and above all, make them feel that you are doing your utmost to help them. After all without them, your business goes down the drain. The speed reviews, both good and bad, catapult around cyber space means that more so than ever, there has to be a huge focus on customer service. Your customers must feel important, special and valued. If they don’t, they will go elsewhere. It’s as simple as that. Instead of thinking of customer service as an extra expense, think of it this way: if you make just one customer happy, they will tell their friends, family and colleagues who in turn may become customers too. Even with all the incredible technological advances we have made, the power of word-of-mouth marketing should never be underestimated. All too often there is too much focus on the sales aspect of customer service with very little on the importance of building strong relationships. Loyal and returning customers are the aim of the sales process. Many salespeople could sell ice to an Eskimo but that is pointless if the Eskimo doesn’t come back time and time again as a result of an easy and rewarding experience. Building trust with your customers is essential. They must know that you are there for them – listen, help, and check in with them occasionally to see how they’re getting on with their new product or service. Treat them the way you would expect to be treated. It sounds so simple but businesses often get so caught up in the products they are developing that the focus quickly slips away from the most important asset a company has – the customer, and what they need. Spend time ensuring there is a clear understanding of your existing and potential customers and what exactly they would want in a particular product or service. This understanding only comes from investing time getting to know them, and taking the time to work with them to create a tailor made strategy that best fits their business. In this sense, the customer is right. 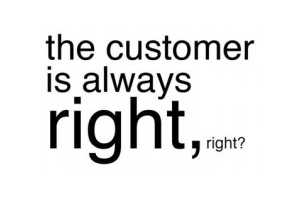 In fact, it’s true: the customer is always right. Give them what they want, and everybody benefits.